UdB image from early 1982. Introduction: The Evolution of Unión del Barrio. I. 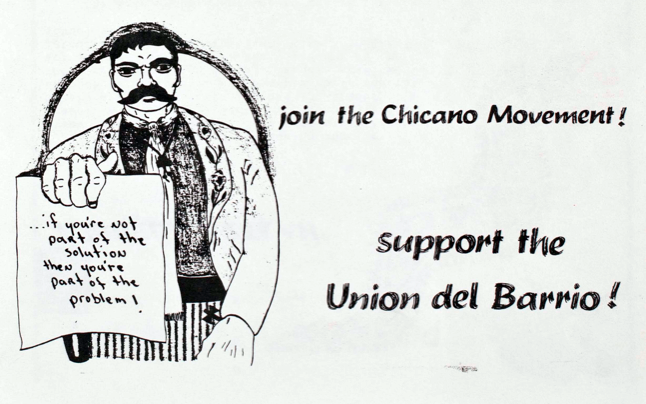 1981 to 1983: The Re-Orientation of the Movimiento & the Founding of Unión del Barrio. II. 1984 to 1986: Ideological Growth & Development. III. 1987 to 1991: Organizational Consolidation. IV. 1992 to 1996: A National Movement & An Advanced Political Organization. V. 1997 to 2000: The 1st UdB Congress & A Period of Mass Campaigns. VI. 2001 to 2004: “3 Bases en 3 Años”. VII. 2005 to 2008: Significant Steps Towards Democratic Centralism. VIII. 2009 to 2012: Resisting A Period of Mass Repression. IX. 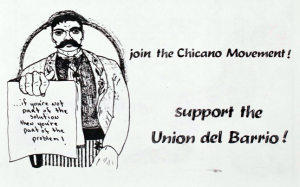 March 26, 2012: The Legacy of Compañero Ernesto Bustillos. X. 2013 to the Present: What Still Needs to be Done. Conclusion: The Ongoing Contributions of UdB to the Movimiento. Preface to the Online Edition: Unión del Barrio has over 30 years of experience behind us. For the purposes of more clearly representing this rich history of struggle, this online narrative has been divided into 11 parts and should be considered a work in progress. The videos provided in these sections are also draft versions in most cases offering only a slide show to accompany the written history of our organization. The videos were originally developed for the 25th Anniversary celebration of UdB in 2006. This work is primarily based on the UdB history book “Un Pueblo Sin Fronteras” (see archive), published in 1998 to document the first 15 years of UdB. The original 1998 version history book is currently out of print, but it is being revised, expanded and updated to be published again as a book. Originally published as a series within ¡La Verdad! in 1997. Revised 06/1998, 09/2007, 10/2010 & 07/2014. GO TO FIRST SECTION (Intro to UdB History).